Founded in 2005 in historic Fairhaven, Washington, Sirena Gelato was founded by our family, following many decades of successfully working in the restaurant and hospitality industry. We were trained in the art of gelato production by a third generation Venetian dessert specialist who taught us his family methods. Today, Sirena Gelato strives to produce the highest quality product available, made in the heart of Bellingham, Washington. In 2011, we opened our second location in beautiful downtown Kirkland, Washington. Most of our fruit flavors are fat-free, dairy-free sorbets made from delicious seasonal favorites. Our dairy-based flavors are made with exotic ingredients, including Turkish imported organic hazelnuts, premium black cocoa chocolate, and slow roasted pistachios. Every batch of our gelato is made the old-fashioned way, hand scooped and hand decorated, one pan at a time. Over the years, we have expanded our offerings to include mouthwatering cafe affogatos, gelato cookie sandwiches, milkshakes, espresso drinks, custom cakes and gourmet popsicles! Keeping with tradition, our gelato is made with milk instead of heavy cream, resulting in less fat and calories than traditional ice cream. 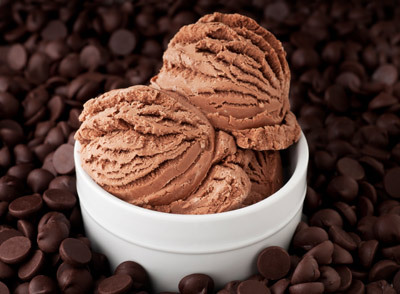 Gelato also contains far less air content than ice cream and is not frozen as deeply, resulting in a denser texture and more satisfying flavor on your palate. The Italian name, Sirena, translates into “mermaid” in English. During Classical times, legend has it that beautiful mermaids would sing enchantingly from the depths of the oceans, luring weary sailors to her lust. In our modern age, Sirena still entices those on an adventure – for a delicious treat! Come see what’s in store today!